Today we look at an application which seeks to address some of the recent concerns surrounding housing diversity in apartment living and resident amenity. 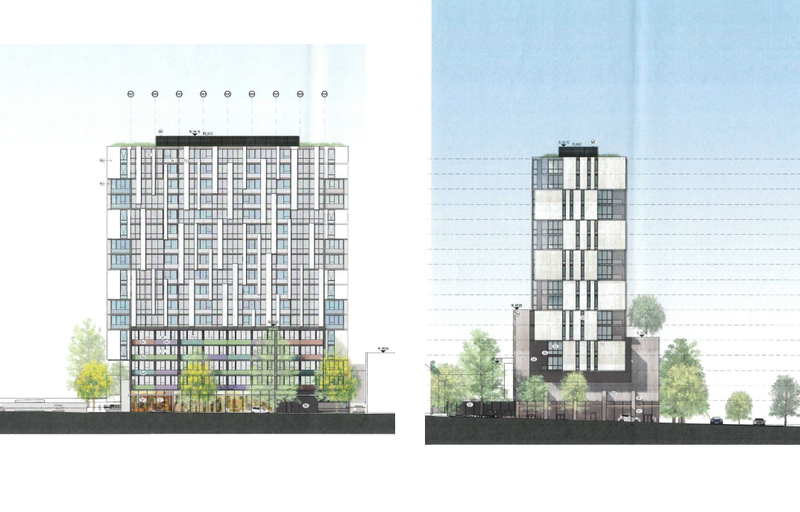 Z66, to be located at 66 Lygon St in Carlton would see the current building occupied by the DownTowner demolished to make way for a 14-storey, Fender Katsalidis-designed apartment building. The proposal aims to create a new character for the precinct through a dramatic interpretation of the traditional stepped approach of the tower and podium massing. Instead there is an integrated tower and podium, where the "U" shaped form of the podium clasps the tower from below. As an overarching design philosophy, the proposal aims to stack the mass that would have been available by developing the whole site, into a smaller building footprint to provide all apartments with views out and eliminate south facing or internally overlooking apartments. This results in a higher form, however we feel this is appropriate given the significant nature of the corner site on main roads; the height has no additional detriment to neighbours through overshadowing or overlooking; and we feel this height is an appropriate transition from the tall city towers to the finer grain of Lygon Street to the north. Z66 has been designed to maximise solar access with all apartments benefiting from a 'great outlook' that has resulted from no apartments overlooking one another, and no south facing orientation. The impacts of any future neighbouring developments have also been considered with a considerable setback employed from the western boundary above the ground floor area, and to the east above level four. This doesn't just safeguard the amenity of residents in Z66 but also any future neighbours. The ground floor consists of a wrap of retail to Lygon and Queensberry Streets with all ancillary programme relegated to the shared accessway to the south. The retail to the north is setback from the boundary to form a sheltered colonnade to Queensberry Street and a landscaped outdoor area is located to the south-east and north-east corners of the site. Apartments facing the landscaped area feature a 'balcony buffer' which in turn acts a buffer between the development and the adjoining Romanian Orthodox Church. Habitable rooms, such as bedrooms and living rooms in each apartments have access to direct light and air. Living rooms and bedrooms are oriented to face balconies or the external edge of the building, and provided with operable windows for access to natural ventilation. 'Borrowing' of light is avoided. 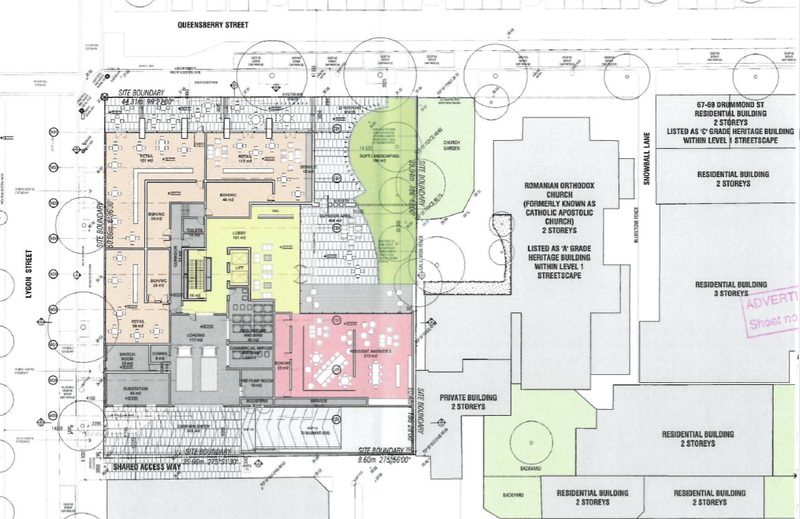 The setback from the East boundary results in a relatively small building footprint, which enables internally overlooking apartments to be eliminated in the development. The open landscaped area to the East also improves the amenity to the Romanian Orthodox Church garden next door. 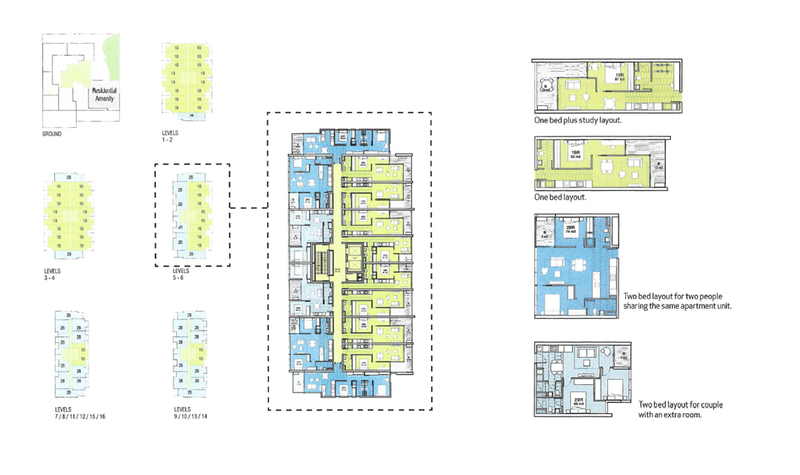 The development receives abundant daylighting to the East and West and south facing apartments are avoided. The building's facade is articulated via a series of concrete panels and glazed fenestrations. To the north and south the building presents as quite a solid, ordered structure whereby the concrete panels are double height and arranged with a strong emphasis on horizontal movement; the positioning of the panels in a staggered formation give the impression of a shifting in form. The other visual effect is one of ambiguity of scale: though a 16-storey building the impression is one of only eight or so, at least to the north and south. The eastern and western elevations on the other hand appear far more permeable with glazing taking precedent over concrete, with an almost adhoc approach as to how the facades are presented; the emphasis shifting to a much more vertical movement visually. The development is also comprised of a residential amenity space at ground level that can be used by residents for dining, lounging, meetings as well as appreciating the landscaped area fronting Queensberry Street. Within each apartment category (one bedroom or two bedrooms), there are different layouts to suit different living arrangements. Within the one bed apartment units, there are two types, which are the one bed plus study and the one bed. The one bed plus study layout could suit a couple where 1 person works from home or requires a separate study space. The one bed will be a more affordable option for single person or couple where the study space can be part of the bedroom. Within the two bed apartment units, there are also two types. One type is an option for two people sharing the same unit, and another type is suited for a couple who require an extra room for guests / older children or even study space. Projected project cost of $47 million. 428sqm landscaped area addressing Queensberry Street and the Romanian Orthodox Church. Allocation of 30 visitor bike spaces. Mixture of one and two bedroom apartments. 361sqm of retail on ground floor. The proposal while not ground breaking in terms of its architecture sets itself apart from other similar developments; while it employs a built form almost twice that which is called for in the Design Development Overlay it does not seek to occupy the entirety of the site. In doing so it achieves a quality outcome for the residents who would call it home and provides saperation between itself and the Romanian Orthodox Church rather than suffocating it by developing to its site boundaries but a lower height. The design team have conceived what can be best described as a thoughful proposal, one that assesses any potential impacts in the short-term but also long term future. Similar to Piccolo Developments' Upper House nearby, Z66 would command a corner site and as such greater height is appropriate to address its position. This particular stretch of Queensberry Street will continue to see significant development and growth with medium to higher density slowly creeping from the confines of the traditional CBD.